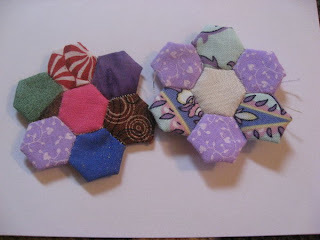 Yep, I'm on a roll with hexagons. I'm obsessed, really I am. I've got 4 pencil cases full of hexies, and 6 of those craft containers with dividers full of basted hexagons. DH just found out that he is sent to Boston for 4 days and I'm going along with him and our DD. 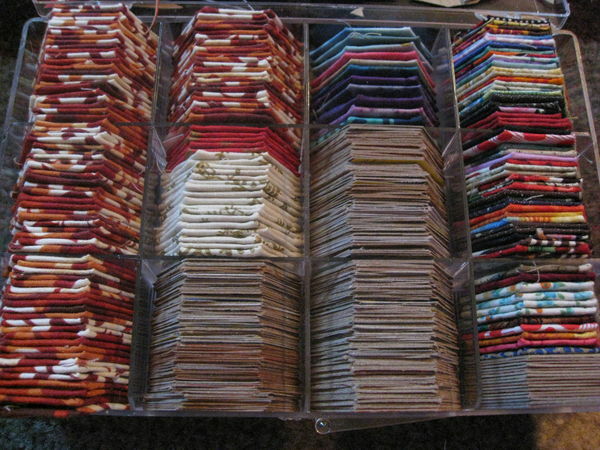 So I figure that the car drive up to Boston will be a great time to put them together. 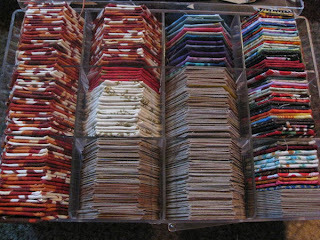 I have 600 of the 3/8" hexies basted and about half of them are in flowers - and those flowers are currently in the room past my DD's (and she's sleeping now!! a rare feat) so I'm not going any where near her room lest I disturb her. In case anyone wants to know, I'm being eco-friendly. All my hexagon templates are cut from a plastic template that I made, then trace that template on cereal boxes and Smart Ones boxes. These are 2 of the 3/8" hexagon flowers. 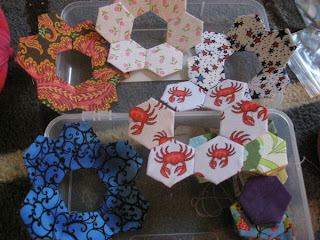 I have a whole bunch of these hexies basted - this is just one small handful. Here are some of the larger flowers. They do have a center, and at the time of the picture, they didn't, but they do now. And here's ONE of the craft/pencil boxes. 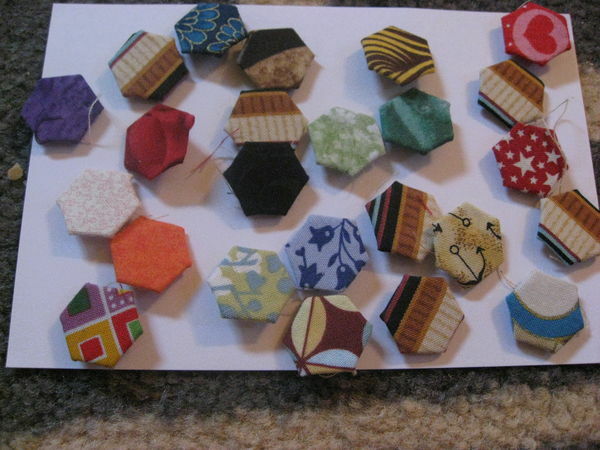 Both of the sides are full of basted hexies, the two centers have some of the cardboard templates in it. And I still have 3 more cereal boxes ready to cut up. It is a great portable project for fun on the road! That passes very well!